This shop is part of a social shopper marketing insight campaign withPollinate Media Group™ and Rubbermaid and Sharpie but all my opinions are my own. #pmedia #RubbermaidSharpie Super Bowl really means super commercials and an excuse to break our New Years Resolutions and eat some amazing recipes. You can find a round-up of some amazing super bowl recipes on this previous blog post. This Super Bowl my youngest and I will be traveling back from a trip to Orlando, so we had a faux super bowl party this past weekend to watch the playoffs. 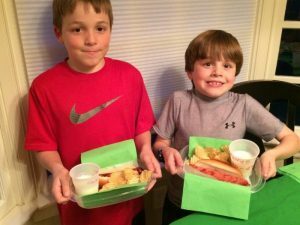 I thought I would share some fun kid friendly Super Bowl party ideas since so many of us have kids around that night. 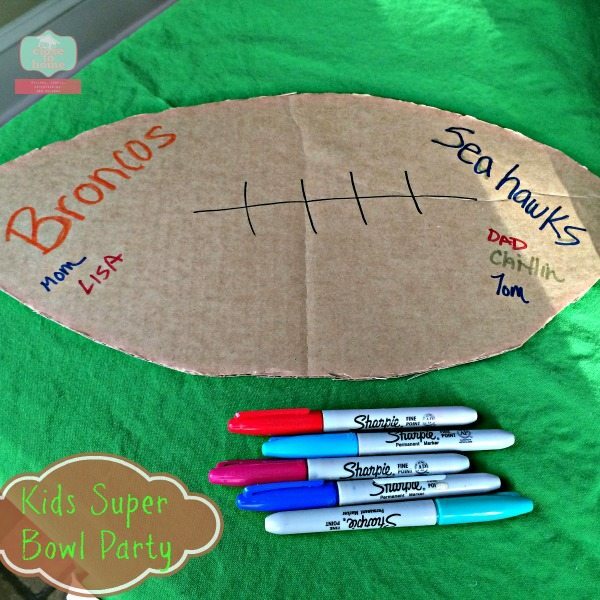 No party does not include a trip to Target where I got some inspiration for this kid friendly Super Bowl party. Since this post is about the kids I thought I would keep the menu simple but still keep with the game day party theme. 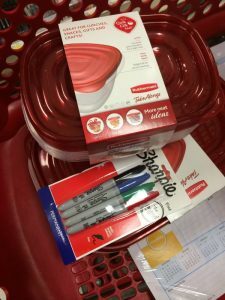 I picked up some Rubbermaid food storage containers as well as some Sharpies to help get this party started! DECOR: Instead of buying a new table-cloth, I did make a disposable football field table-cloth in a previous post, I had a green Christmas one that I turned over. (other side had a banner of ornaments). Also I cut out a simple football out of a cardboard box and had the guests pick a team they thought would win the game. (remember this is a faux party so teams may be different that actual super bowl) This adds a little friendly competition to the party!! FOOD: Inspired by some recipes I have seen on Pinterest I decided to make a 5 layer dip to resemble a football field. I had to switch up the layers a bit but you get the same taste. 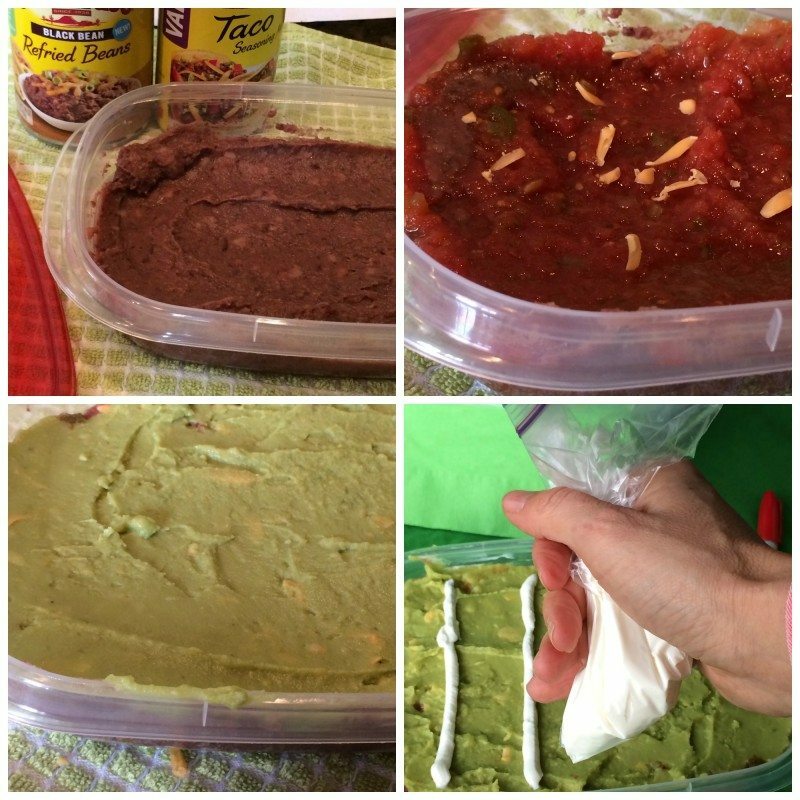 I made the dip in a smaller rectangular Rubbermaid container. This worked out well as you could cover it and place it right back into the fridge until serving time. (The guacamole stayed green even the next day) We filled a plastic baggie with some sour cream to make the stripes on the field. 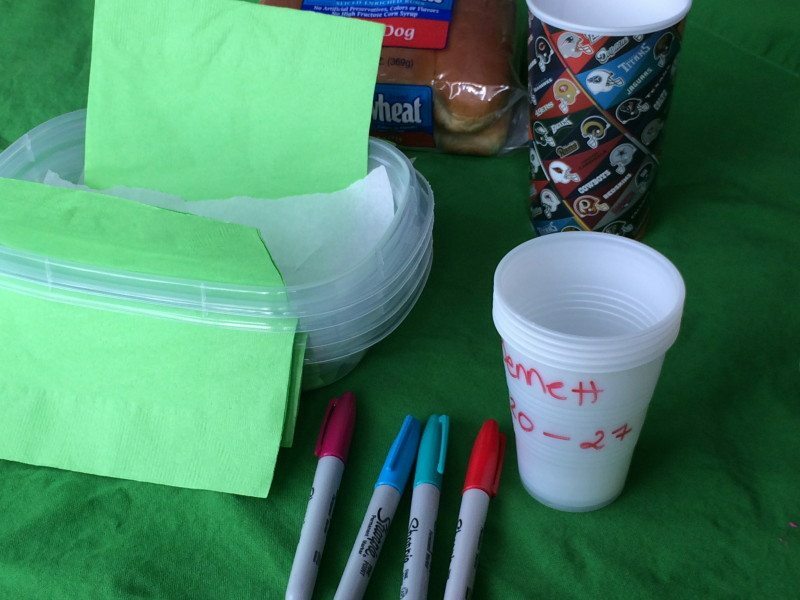 When it was time for the party, I placed the dip inside a larger rectangular Rubbermaid container, which we decorated a little with our Sharpies. We filled the rest of the container with tortilla chips. You could change the “fans” by using different colored chips or adding veggies or crackers too. You can cover the entire dip and transport it to a party or store any leftovers. This makes entertaining and clean up a breeze. For Dessert I decorated some already frozen chocolate covered Strawberries I found in the freezer section with some white frosting. 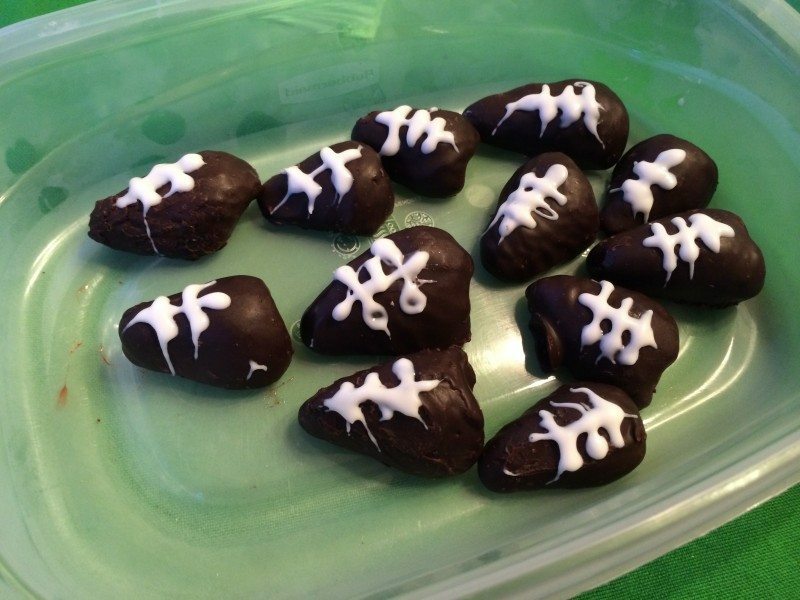 Super easy super bowl party dessert idea. Dark Chocolate and strawberries what is not healthier. I don’t know about your kids, but how many times have they gone through a buffet line, at your house or restaurant, and the food slides of their plate? 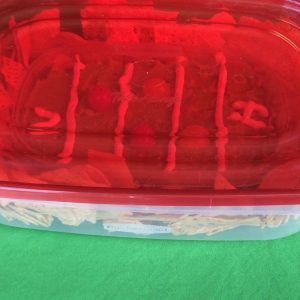 Since we wanted the theme of a football game day, I used more of the smaller Rubbermaid Containers, added a festive napkin with a piece of parchment/wax paper on the very bottom. These served as the kids plates and limited spillage as they went through the line to grab their dinner. The kids felt like they were at a stadium with these food plates. You could even have the kids decorate the containers with Sharpies before hand if you need to occupy them. They can take them home after the party. Either way, using these Rubbermaid containers as plates also makes cleans up is a cinch. No matter what team you are rooting for, don’t forget if you are having kids at your Super Bowl party, have some kid friendly foods and activities so everyone will have a great time!! 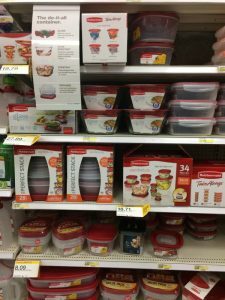 To get some of these party supplies at a deal, text COUPONS to TARGET on you cell phones and grab a $1 off Rubbermaid food storage coupon and a $1 off Sharpie 4 pack or larger from Jan. 25th to Feb 8th. Did you know you can always text COUPONS to TARGET for any up to date coupons? 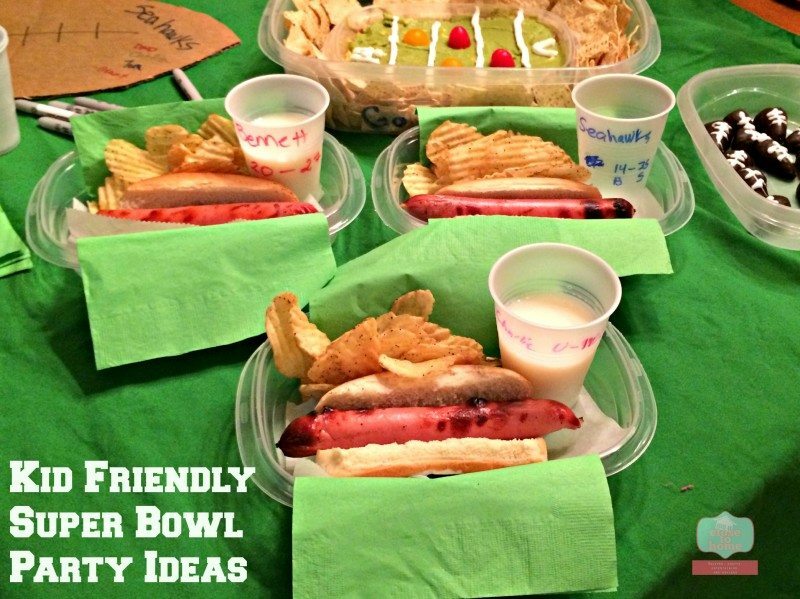 How do you incorporate kid friendly ideas for your super bowl events? Thanks Andrea the kids loved it too. thanks for stopping by Corinne, who are you rooting for? 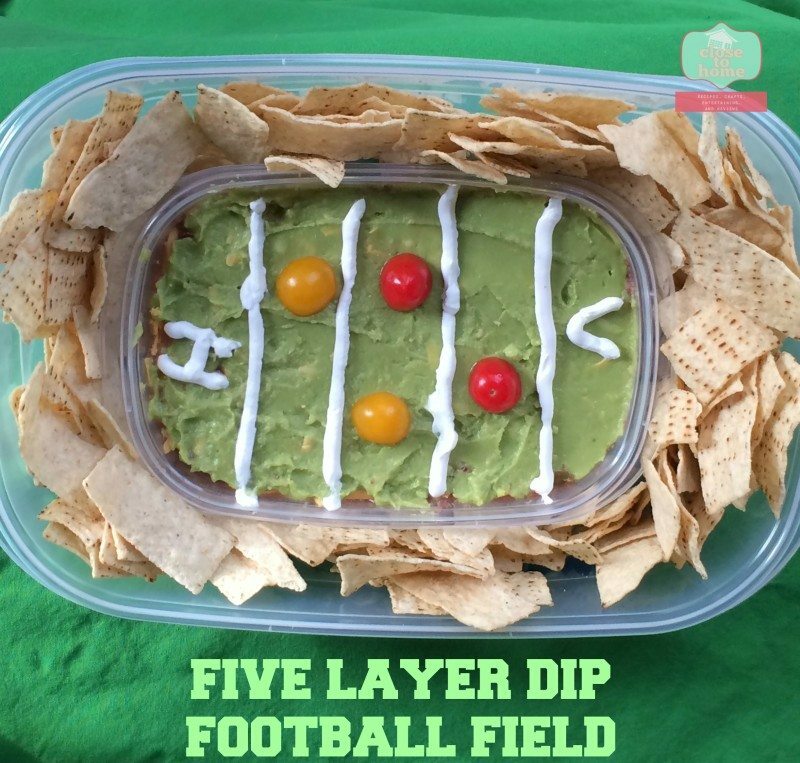 I love the football field five layer dip idea. What a clever appetizer for game day! I love the strawberries but on a side note, you can get the containers at the dollar store! They carry betty crocker ones. OMGosh I LOVE this! The kids are going to love this too! How cute are these snacks, and they look so yummy too! thank you so much for sharing! loved seeing all the pics! Oh those are definitely cool! Kinda like being at the game! I bet everyone enjoys this! The 5-layer dip looks really good! My cousin’s son is really into football so I might have to send her your way!